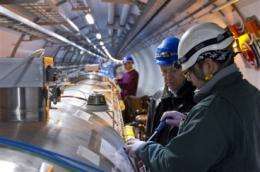 (PhysOrg.com) -- In December, the Large Hadron Collider, the world's largest particle accelerator, shattered the world record for highest energy particle collisions. This week, team led by researchers from MIT, CERN and the KFKI Research Institute for Particle and Nuclear Physics in Budapest, Hungary, completed work on the first scientific paper analyzing the results of those collisions. Its findings show that the collisions produced an unexpectedly high number of particles called mesons — a factor that will have to be taken into account when physicists start looking for more rarer particles and for the theorized Higgs boson. “This is the very first step in a long road to performing extremely sensitive analyses that can detect particles produced only in one in a billion collisions,” says Gunther Roland, MIT associate professor of physics and an author of the new paper. Roland and MIT professors Wit Busza and Boleslaw Wyslouch, who are members of the CMS (compact muon solenoid) collaboration, were among the study leaders. The CMS collaboration runs one of four detectors at the collider. The Large Hadron Collider (LHC), located underground near Geneva, Switzerland, started its latest run in late November. On Dec. 8, the proton beams around the 17-mile ring collided at a peak energy of 2.36 tera electron volts (TeV), breaking the previous record of 1.96 TeV achieved at the Fermi National Accelerator Lab. Because of Einstein’s equation, E=mc2, which correlates mass and energy, higher energy levels should produce heavier particles — possibly including some never seen before. In the new paper, submitted to the Journal of High Energy Physics by CMS, the physicists analyzed the number of particles produced in the aftermath of the high-energy collisions. When protons collide, their energy is predominantly transformed into particles called mesons — specifically, two types of mesons known as pions and kaons. To their surprise, the researchers that the number of those particles increased faster with collision energy than was predicted by their models, which were based on results of lower-energy collisions. Taking the new findings into account, the team is now tuning its predictions of how many of those mesons will be found during even higher energy collisions. When those high-energy experiments are conducted, it will be critical to know how many such particles to expect so they can be distinguished from more rare particles. Using the Large Hadron Collider, physicists hope to eventually detect the Higgs boson, a particle that is theorized to give all other particles their mass, as well as evidence for other physical phenomena such as supersymmetry, extra dimensions of space and the creation of a new form of matter called quark-gluon plasma (QGP). The new data provide an important reference point when CMS will look for signatures of QGP creation in collisions of lead ions at the LHC later this year. The CMS team, which includes more than 2,000 scientists around the world, has 45 members (including faculty, students and research scientists) from the MIT Laboratory for Nuclear Science’s Particle Physics Collaboration and heavy-ion research groups. The Large Hadron Collider is capable of creating collisions up to 14 TeV, but scientists are gradually easing the machine up to that level to try to avoid safety issues that have arisen in the past. In September 2008, the collider had to be shut down for several months after a connector joining two of the collider’s magnets failed, causing an explosion and leakage of the liquid helium that cools the magnets. If a particle or wave- was produced that effected local gravity. And if it was accidently produced in large quantities that it masked all other data becuase it was changing the trajectories of the particles that they ar enow ignoring. - Or - Broke the LHC because it changed the focus of the beam being fired and it cut into a surrounding magnet. Maybe they should try to understand WHY there are more particles being created than expected instead of simply REVISING their estimates of what will happen next at higher energies? Maybe I misunderstood? I totally agree. My first thought was poorer than expected beam quality. Second thought was non-linear processes at work(inevitable as power increases, in many systems). Third thought was that #2 contributes to #1. The point that I find most interesting is that they mentioned they based their expectations on E=mc^2. If their predictions are wrong/off and we are working in energies that have never been attained artificially before, could that imply that there may be additional variables, mathematically and physically, that they should attempt to address before ramping up? I am all for blazing a path into the unknown but we should understand all aspects of the results, as much as possible, before going much further. Lets hope they are not smashing more than they think they are! Such as the structure of space itself. aether to some. "The point that I find most interesting is that they mentioned they based their expectations on E=mc^2. If their predictions are wrong/off and we are working in energies that have never been attained artificially before, could that imply that there may be additional variables, mathematically and physically, that they should attempt to address before ramping up?" Nope. E=mc^2 is the best way to characterize particles, since it simplifies the math considerably (gets rid of annoying conversion factors). Totally standard for the last century, and no reason whatsoever to think otherwise. Maybe they should try to understand WHY there are more particles being created than expected instead of simply REVISING their estimates of what will happen next at higher energies? Maybe I misunderstood?" There isn't much point to building a detector if you don't use it. This is just part of the process of understanding the machine, or hopefully new physics. The r is next to the e on the keyboard. It was a transcription error. As for more particles, they're not creating MORE particles than they put energy in for, they're noting that the distribution of particle types is far different than they expected. Pound of granite vs a pound of feathers, which is heavier? In other words, their models are wrong and require some more refinement when compared to observation. This was my point exactly. Correct me if I am wrong but isn't the fact that their experimental observations deviate from their expectations mean that there could be new physics at work? Unless they can figure the math was incorrect. But, if it is correct, then that means there is something we cannot account for. And that means, new physics. The scientists working on this project are some of the brightest individuals on the face of the planet and they have committed their mental faculties to understanding these problems. I highly doubt they miscalculated or used simplified equations to create their estimations. If they needed supercomputers for the effort I am sure they could afford it. LHC people know perfectly about what they're doing - and they're fully responsible for it. I highly doubt they miscalculated or used simplified equations to create their estimations. LOL, they've no calculations and they never did some - the very first serious calculations done by their own theories were just finished before few days. Welcome into reality. "Curiously, though, nobody had ever shown that the prevailing theory of gravity, Einstein's theory of general relativity, actually predicts that a black hole can be made this way. Now a computer model shows conclusively for the first time that a particle collision really can make a black hole." They of course never calculated too, if such black hole could swallow Earth, or not - if they never calculated its formation. It's all blind experiments. So March may be the end then. At least we wont have to wait 26 years for the apothus asteroid. Time for much spending I believe. But will we have time to say we told you so. and if they do create a hole in the space fabric will it continue to expand. Did they say what percentage of extra particles there were that they hadnt allowed for? The Planck energy is about a thousand trillion (1 quadrillion, 10^15) times the energy that will be involved in the collisions at the LHC. The only known way for a black hole to form would be if there are extra dimensions curled up so that gravity is stronger over small distances. However, no one has ever detected anything that would imply such dimensions exist (much less are of the right size to be accessed by the energies at the LHC). The fact that there are air showers from cosmic rays of much higher energy than will be employed at the LHC means that even if black holes are formed they evaporate quickly. Since if a black hole were formed and it did not evaporate, nothing would be detected at the detectors. Could the known black holes indicate that someone out there has tried this experiment before? seneca, first rate comment. More discussion participants ought to cite extra sources like this. Doing so expands the discussion, recruits more info. The formation of black hole phenomena like jet suppression or condensation of particles into larger clusters (pentaquark) was observed already at Tevatron. In fact, scientists are pretty sure, they would observe it - why do you mean, article is named "first glimpse of new physics"? The problem is, people doesn't understand, what the "new physics" is and what doesn't. When I express my own opinion only, people would rate me low. When I compose my post only from quotations of another articles, people would rate me low as well. Air showers prove anything about LHC safety, because they're always formed by single particle at its very beginning and they've no zero momentum toward Earth. Concerning the Planck energy, what will happen, if two proton rays (each of energy of fast moving train) would collide with speckle of dust inside of accelerator? Such ideas existed from very begginning of cosmology. But I don't think, during collider experiments true black hole could be ever formed. Nobelist Frank Wilczek once said that smashing quarks will turn the Earth into a supernova and I think, it's much probable scenario, then the black hole formation, because micro-black holes are equivalent to so-called strangelets predicted by Ed Witten, instead. The would convert Earth into fast evaporating cloud of strangelets, instead. We can consider model case of neutron, for example. This particle is unstable and it decays in fifteen minutes timescale. Only hydrostatic pressure inside of large neutron stars could inhibit the decay of neutrons. Does it mean, the less neutrons we take, the more safe we are, because of their decomposition - or not? Well, there still exist possibility, small number of neutron will mix with another particles under formation of quite stable atom nuclei. Inside atom nuclei neutrons aren't stabilized by hydrostatic pressure, but by surface tension, so called strong nuclear force. The strangelet concept is based on similar idea, just with more dense weakly interacting elementary particles. Nobody knows, what can happen, when for example neutrino would condense into dense form of matter - there's no force, which could separate them mutually in similar way, like neutrons. Please note, these particles cannot become very large - if they would grow too much, the surface tension forces will become insufficient to keep them together due their low surface curvature in similar way, like huge atom nuclei or mercury droplets will separate spontaneously, when they become very large. Therefore the secret in strangelet preparation aren't brute force collisions - rather matter of thorough condensation of matter by external fields, for example during collimation of proton jets by supermagnets of collider. Theoretically we could prepare micro-black hole just by careful cooling and condensation of neutrinos. 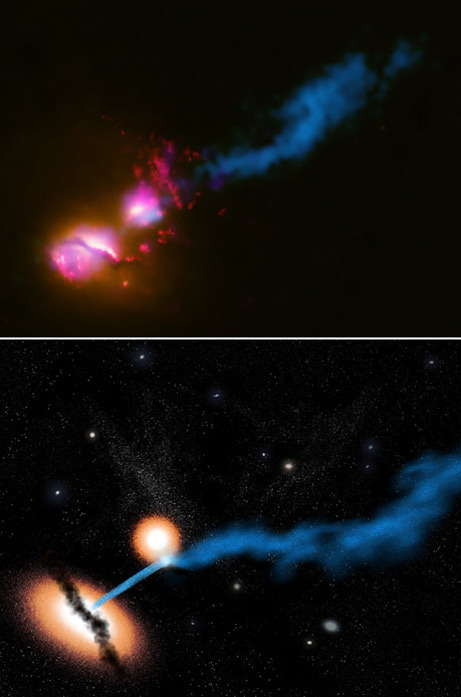 The formation of such particles during stellar collisions is extremely improbable in similar way, like spontaneous formation of boson condensate made by laser cooling of atoms - but the human intelligence could cheat the Nature and to prepare particles, which could never form in it spontaneously. I'm afraid, scientists never understood LHC stuff in this way. You don't really have an opinion of your own. You just mix everything up you find somewhere. Anyway, why take it so personal? Saying someone has no opinion is pretty rude. I like it when people include links. If I'm interested in what they said I can follow a link to see what else there is on the subject. In addition it's quite easy to (dis)prove it - can frajo find an explanation of strangelets given here somewhere else, for example? While higher energy beams tend to produce heavier particles, i think there are threshold levels for these superheavy particles, just below the treshhold it makes sense that you need an extra increase of intermediate mass particles creation to keep the checkbook of mass/energy balanced, for me, this sudden spur of particles is a hint they might be in 80-90 percent reach of the next level threshold. FRAJO.... you should know that all advances in science are made from expanding on other people's work... that's why when you publish... if u have ever in your life done so... you will notice that there is a section where the author cites his REFERENCES. "To their surprise, the researchers that the number of those particles increased faster with collision energy than was predicted by their models, which were based on results of lower-energy collisions." Huh? is this english? Perhaps it must be too late and I'm tired? Either I can't get the sentence structure right in my head, or it's just not formed correctly? why do you mean, article is named "first glimpse of new physics"? All the article says is that more mesons were detected than had been predicted; there is no suggestion that this indicates extra dimensions. Air showers prove anything about LHC safety, because they're always formed by single particle at its very beginning and they've no zero momentum toward Earth. Center-of-momentum frame energy is center-of-momentum frame energy whether the particles collide in Earth's atmosphere or in the LHC, it is only the momentum with respect to the Earth that is different. The formation of a black hole is dependent on the energy of the collision, not the momentum relative to Earth. If a black hole were formed and consumed the total energy of the collision and did not evaporate, no signal would be detected on the ground (contrary to observations). "They" observed jet suppression or pentaquark formation already at Tevatron - why they shouldn't observe dijet suppression and formation of much larger particle clusters at LHC? CERN guys know very well, what they could observe, because they observed it already - my problem is, that these stuffs aren't quite safe. ..that more mesons were detected than had been predicted..
Mesons are expected as a products of strangelet decay - they're rather heavy and stable particles. It means, the more mesons, the stronger is the evidence, product of collisions decays in independent, non thermal process mediated by strong nuclear force. 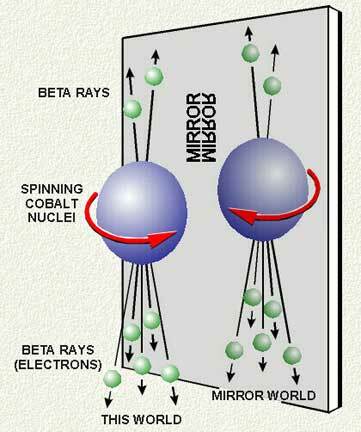 Such stabilization of collisions products is considered as one of evidences of extradimensions. This is a good point indeed - even if micro-black hole would formed in stratosphere, it doesn't mean, it could be detected at Earth because of atmosphere. The somewhat funny thing is, some scientists are repeating "LHC is safe, because no black holes could be formed from cosmic rays neither", because they want to get grants for LHC collisions ... while another scientists are already spending another grants for their detection in stratosphere. The analogy with global warming hoax is quite obvious here: scientists doesn't care about controversies of theories, some safety concerns the less - only for money for their research. Current situation is, every argument of LHC defenders regarding LHC safety could be objected by some other peer-reviewed theory, which predicts exactly the opposite. Concerning the Planck energy, what will happen, if two proton rays (each of energy of fast moving train) would collide with speckle of dust inside of accelerator? The article you linked to was interesting, as it gave an explanation of why non-paired jets would be produced during black hole evaporation. This mechanism isn't so obvious. While it's generally considered, one of jet is dispersed by quark-gluon plasma, formed by collision, I would rather consider it as an evidence of CP violation, which could be observed at the real black holes: most of black holes observed exhibits only one polar jet, too. It means, black holes inside of galaxies decay like oriented cobalt atom nuclei, on which parity violation was observed first in 1954 and black holes prepared in LHC are behaving in the same way. If large extra dimensions do exist, the calculations predict that Auger should record tens to hundreds of showers from black holes in its first few years of operation, starting around 2004. The Pierre Auger Observatory has been in operation for several years now and not a single confirmed shower of the form expected from the production and evaporation of a black hole (BH) has been observed. Several showers from cosmic rays with energies of over 100 million TeV have been observed, so I doubt any BHs that do not evaporate are produced at any energy remotely close that of the LHC. How can adding energy to a collision that forms a BH give a collision that does not form one? At the case of dust speckle collision you should consider all protons in jet, not just some two colliding ones, because the diameter of such speckle is comparable to diameter of whole proton jet. And the atoms in speckle will not be "ripped off", but smashed together by brute force of all colliding protons, because they have nowhere to escape. Why LHC proponents always see the situation from another, quite opposite perspective, then this one, which everyone could expect? Scientists are payed by us for to predict ALL SITUATIONS - not only these, which would allow them in experiments in safe way. If they cannot, they're cheaters like Pachauri or incompetent idiots. It's about safety of all of us - not just safety of few dull scientists. ..so I doubt any BHs that do not evaporate are produced at any energy..
Doubting won't help you very much at the case of real problem. For example, no one "expected", the problem in single supermagnet could destroy one quarter of LHC in avalanche like mechanism - but it still happened. Why? Because scientists are payed for calculations - their interpretations are problem of the rest of society, not the job for specialists, who cannot think in wider consequences. And we have calculations already, which are proving, stable black hole could be formed during LHC collisions. What you're doubting in or not isn't relevant at all, after then. You can only write another peer-review article with better calculation, that's all. Richard Feynman once said: "Shut up and calculate!" Can you understand it? If you're unsure, just calculate the risk exactly - or stop the experiments. This is what the scientific approach to problem of LHC security means. The problem of LHC security opened the controversy of Popper's approach to scientific method and CERN scientists are apparently unable to manage it. So far every theory or prediction was considered false until it wasn't confirmed. The LHC case reversed this situation completely: we all must be perfectly sure, disaster cannot happen there. The naive skepticism of scientific community suddenly doesn't work here. The disparaging stance: "I doubt, such thing could ever happen because of lack of calculations - it's your turn to prove me, such possibility can happen" becomes dangerously ignorant stance here. Now it's job of scientists to have all calculations prepared for all scenarios possible - not just for these awaited ones. Scientific community isn't apparently prepared to such supersymmetric situation. The LHC case revealed limits of contemporary scientific method - or rather ignorant interpretation of it, because Poppers method is completely symmetric in fact. The Pierre Auger Observatory has been in operation for several years now and not a single confirmed shower of the form expected from the production and evaporation of a black hole (BH) has been observed. Maybe that's because they don't evaporate. Several showers from cosmic rays with energies of over 100 million TeV have been observed, so I doubt any BHs that do not evaporate are produced at any energy remotely close that of the LHC. Maybe that's because they scattered the energy in a shower. You do know that only an infinitesimally small percentage of collisions in the LHC are expected to be dead-on enough to create black holes, right? Apparently you don't understand scattering. Scattering divides the energy, not multiplies it.